Can Government Chatbots Increase Customer Engagement? Government agencies always need to find ways to do more with less. And as the population continues to grow, agencies need to simultaneously increase the level of services they provide to the public. 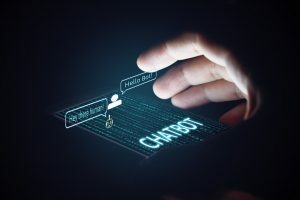 To that end, chatbots offer a great opportunity for government agencies to increase engagement with customers with new and innovative technology. Here are 4 ways chatbots increase customer engagement. Chatbots are designed to look and feel like humans. In fact, a customer can’t even tell the difference between a really good chatbot and a human. Chatbots achieve this almost miraculous feat because of personalization–chatbots can greet you by name, have a dialog with you, and even crack jokes during an interaction! Furthermore, chatbots have the capability of retaining past customer interactions in order to enhance future interactions. Customers are very engaged with anyone (even a chatbot) that remembers his/her name, preferences, and past history. There is absolutely no learning curve to use a chatbot. Since chatbots use text and/or speech interfaces, everyone can intuitively and effectively use a chatbot immediately–if you know how to talk and/or type, then you know how to use a chatbot. Contrast this to websites and mobile apps which require the user to learn all of the different features to effectively use them. Chatbots also understand natural language, allowing them to correctly respond to many variations of a request. For example, let’s say you want to ask a chatbot for help. You can say: ‘I need help’, or ‘help me’, or ‘what can you do’, or ‘I don’t know what to do’, and a good chatbot will interpret any of these variations as a request for help and respond to you with help options. Customers want services beyond the normal 9 am – 5 pm business hours. Why not have chatbots that can provide services 24 hours a day? Offering government services beyond normal business hours goes a long way to increasing customer engagement. Reducing wait and hold times further engages customers. Rather than keeping phone customers on hold, government agencies can use chatbots to handle simple customer requests immediately.